"When do you leave for Badwater?" asked several people, trying to find something "normal" to talk about in the midst of such insanity. But I went through the motions, as many of us do in the midst of tragedy. Thursday morning I watched Nancy die. Friday morning I was at Milwaukee's Mitchell International, waiting for my flight to Vegas. Leaving one surreal situation for another. Golf courses in the desert. I continued with the motions. There was no enthusiasm for the race, but I knew that if the tables were reversed I'd be mad at Nancy if she had changed her plans. Inertia in one life does not bring back another. And so I wandered through Walmart, getting a head-start on the massive supply shopping before my crew arrived. The oddest things would bring tears to my eyes. A pizza oven on sale. Garden items. There was no logic. Logic took a vacation before I took mine. The weeping was replaced by laughter; a lot of laughter. One life was gone but so much in life was continuing. Badwater still seemed life a folly to me but perhaps a good folly was what I needed. Van and car packed, we drove to Death Valley. Three of the crew were veterans, both as competitors and as crew people: Nikki Seger, Bonnie Busch and Scott Jacaway. 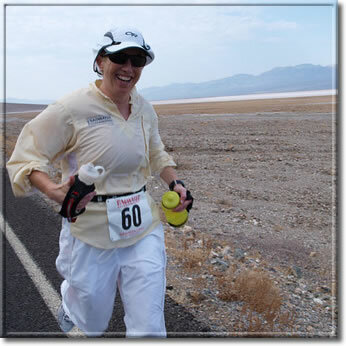 The fourth was a veteran of ultras but a virgin at Badwater: Stephanie Astell. I was continuing a tradition. Three years earlier, Jay Hodde asked me to join his crew. Badwater had never been on my radar but presented with the opportunity, I was curious about it and was glad to experience the race first-hand. Little did I know that I was to be indoctrinated into the Badwater family. Welcome to the family Stephanie! Our first stop was Dante's View. To Stephanie we pointed out the thin ribbon of road that the race would follow. From above, it looks as though someone had just run his finger through the salt and sand to connect the dots between Badwater and Furnace Creek, the first check-point on the course. We headed to race check-in at Furnace Creek. More friends. Lots of hugs, lots of pictures. Lots of pent-up energy waiting to explode. Runners were ready to run. But first, the paperwork and meeting. We learned more about the impact of recent rains. The desert normally doesn't host much moisture. When the rain comes to visit, Death Valley simply doesn't know how to make it feel welcome. Like unruly teens coming home from college, the water spread itself wherever it pleased. Instead of knocking down lamps and leaving food and dirty laundry strewn about the house, the rain moved the house itself -- sand poured across roads, making them unpassable. Just the night before, the race route had been closed in several spots. In an area with few roads, there are few possibilities for re-routing. When the main road is closed, the most practical option is to simply wait until road crews can re-open it. We knew we were lucky. Bulldozers and road graders are nothing compared to Mother Nature's tool box. We would cross the desert and head to Mt. Whitney but only if she allowed it. Sunday night. The crew did more sorting and more organizing as I enjoyed the quiet of my own room. I felt a bit over-pampered but sometimes it's good to be the queen. Nancy's death was still very much with me, but the rawness of the loss was being tempered by the excitement of the race. Badwater still continued to be a folly to me, a silliness, but I was finally beginning to look forward to it. I was anxious to just get out and RUN. Monday morning. As we headed down Badwater Road to the start of the 8 a.m. wave, we cheered the 6 a.m. runners already out on the course. I couldn't wait to join them. I felt like the bucking bronco held in the pen, waiting for the gate to be lifted, waiting for the chance to be let free and GO. My crew reminded me that perhaps I was being a bit TOO happy. Running felt so easy, but they reminded me of the many miles I had ahead of me. "Let's try to slow things down a bit," I heard over and over. "That's a hill Mary, you should be walking... why aren't you walking... WALK!!!" I got to Furnace Creek a bit quicker than planned. Seventeen miles into the race and it seemed so easy, so relaxing. The temps were warming but they were mild by Death Valley standards. Decked out in my desert best, I looked like a Bedouin midget bouncing along under the sun. Pacers began to join me. It was a delight to hear about the race as it was being experienced by our BW virgin, Stephanie. She was practically reciting my script from 2006. "I never realized how beautiful it is here; this is so incredible; I'm so glad to be here." A bit of nutrition, a change of clothes, and off I headed for the 17-mile climb up to Towne's Pass. I knew that it would primarily be a walk for me and I looked forward to just taking it easy and relaxing. No sense fighting with gravity. But it was during the relaxing hike that my monkey first climbed on my back. We all have monkeys in long events. For some it is a cranky knee or ankle. For others, it's the stomach. Me? My monkey was fatigue. Not a yawn-I-am-bored-at-a-meeting-fatigue, but debilitating, I-have-to-be-prone-right-now fatigue. Halfway up the pass I laid down on the cot for the first time. Ten minutes off of my feet and I figured I'd be good to go. The rest helped, but the monkey was still riding my back. I thought back to my days in college, remembering that I could never do the all-nighters either academically or around the keg. My tolerance for sleep deprivation has always been low. Before cresting the summit I took one more break on the cot and then down we ran toward Panamint Valley. The reverse course of gravity perked me up and the monkey slid of my back for a bit. A persistent fellow though, he maintained his pace and stayed with me. I didn't notice how close he remained until we were near to the valley floor. When I stopped for a moment to change my socks the monkey had his chance. He jumped back on and grabbed hold much more tightly than before. The next time I tried to move he wrestled me down. Literally. I was on the ground with my eyes shut. There is some dispute as to what exactly happened. My crew believes that I either momentarily passed out, or I simply fell asleep on my feet. But I knew what happened. The monkey had me in a headlock and was holding me down. I was losing this match but knew there would be others in the miles ahead. I gave in to the monkey and laid down on the cot. It was the best sleep I had had in days -- about two hours total under the pre-dawn stars of Panamint Valley. The legs loosened, but there wasn't a lot of running to be done after that match with the monkey. I moved through the Panamint check-in and up the next climb –– about 13 miles. The sun came up and I was in good spirits again. Coming down the other side I hit the 100-mile mark. I was now venturing into unknown territory, going further in a race than ever before. And the monkey jogged alongside me, every once in awhile, reminding me of his presence -- especially when I'd try to run. Tuesday afternoon, a summer day in the desert, and I was caught in a hail storm. It was cold. Out came the turtleneck and jacket. "Dammit! It's July in the desert, what the f*ck is this all about?" And then it wasn't just the hail, but everything in life that didn't make sense, including friends struck down in the prime of their lives. I was cold, I was tired and I was mad. "What the f*ck, what the f*ck, what the f*ck?!?!?!?!?!" The monkey was so startled he fell off his back and landed smack on his a**. I ran like I hadn't in hours. My pacer tried to say nice things, the right things, to perk me up. But there was to be no perking. I was in my own bubble of anger and planned to stay there. I ran and I ran and I ran. Close to Lone Pine the crew brought out the cell phone and I talked with Dave, my husband -- my home crew. A well-insulated man, he knew that the heat of Death Valley wouldn't be a good match for him. But the race crew stayed in touch with him and he was well aware of how the race was transpiring. It was good to hear his voice. I talked to him again at the Lone Pine check-in. I was enthusiastic. We still had a 13-mile climb straight up to the finish at the Whitney Portal (the trail that takes one to the top of the mountain), but I was near that end and knew that soon the race would be done. We moved up the hill well. At least the first few miles. And then the monkey wanted to have one last wrestling match. I couldn't keep my eyes open. I couldn't stay on my feet. A short nap about four miles from the top and I was still struggling. "Suggestions?" I yelled to the crew. They loaded me with caffeine pills and Coke. The gave me caffeine-filled gels. But what finally worked? What finally got the monkey to loosen his grip? But it worked. Our final song was "If you're happy and you know it clap your hands!" And we did, running across the finish line, clapping and laughing. The anticipated tears were replaced by hysterical laughter. Even the monkey was laughing. And I'm sure that somewhere in that land of the newly deceased, Nancy was too. She always laughed at me -- at me and with me. I finished my race just before 6 a.m. on Wednesday. At 6:30 a.m. on Thursday, I was back at the Portal Trail with my crew, and two other friends -- Lisa and Tim. After visiting the basement of the Western Hemisphere, it was time to take a look at the attic of the Lower 48. We were headed for the 11-mile climb to the top of Mt. Whitney. It would be about 22 up-and-back. Thirteen hours. Amazingly, my legs weren't too bad. Breathing was slow. But I could keep the feet moving as long as I kept my usual chatter to a minimal level. Up we went past the tree line, up though the raindrops, and up to the top where snow flurries greeted us. I stayed long enough to sign the book, noting "Hi Nancy, wish you were here!" and then headed back down.